Delicious Bliss: There are glorious black models in the world Vogue! There are glorious black models in the world Vogue! 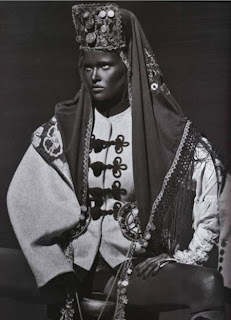 The October issue of Vogue Paris, dedicated to "Supermodels", features Dutch model Lara Stone in black face. Shot by Steven Klien and styled by Editor-In-Chief Carine Roitfeld. A tasteless, boring and unfashionable idea at the least. Trying too hard I'd say, this is a desperate attempt to be controversial to bring attention to the magazine. The issue is dedicated to supposed "Supermodels" and absurdly does not contain one black model. I guess French Vogues idea of a black beauty is a painted one...so sad.